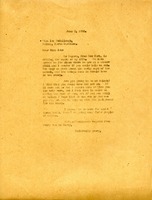 Letter to Ida McCollough from Martha Berry informing Miss McCollough that Mr. Beyers is writing about her life but that they have come to a stand still. Miss Berry asks her to help them come up with the background of the story since Miss McCollough knows so much about the early days of the schools. Miss Berry asks her if she is still at Saluda since she will be there for three weeks. Miss Berry also informs her that she would like to offer her a trip to the schools but that because it is so hot that she feels it would be asking too much of her.